to be held Saturday, December 15, at 8:00 PM. at the Fulton Avenue School in Oceanside NY. - also known as School "8" - at 8:00 PM. We recently celebrated 25 years of singing as "The Oceanside Chorale", giving the gift of community singing to Oceanside and surrounding Nassau County communities. Our 2014 concerts celebrated our Silver Jubilee! In support of our community singing efforts and passion, your attendance and participation is the best gift we can receive. Participation? In our concerts, we include an audience sing-along participation arrangement in our program.There will be many carols you and your family know very well, and we will invite the audience to participate in the singing! If possible, the lyrics to our old favorites will be printed in your program for singers of all ages! The enthusiasm with which you applauded our 2018 Spring Concert gift of song has carried us through to our upcoming Holiday Concert to be performed December 15th, 2018! 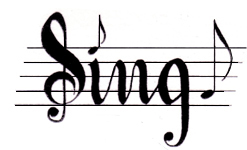 To join us in singing our Spring 2019 Concert, rehearsals begin in January and continue on Wednesdays at 8:00 at the Merle Ave. School, 2nd Floor, in Oceanside. It's never to late to join...Sopranos, Altos, Tenors and Basses - all are welcome! 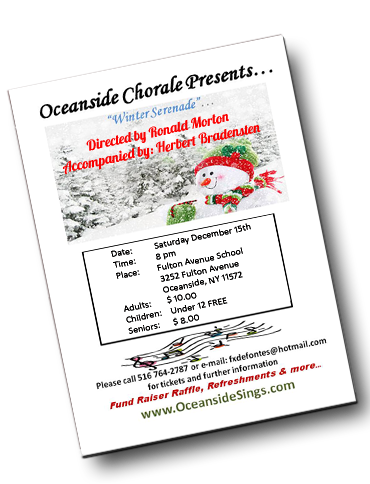 Oceanside Community Chorale is one of Long Island's longstanding community singing groups, providing choral performances to the public and also to schools, hospitals and other worthy organizations. Our members come from in many different Long Island towns and we perform under the auspices of the Oceanside Department of Community Activities, and are grateful for their support over 10-plus years. Our Musical Director, Ronald Morton, our President Frank DeFontes and our Music Committee gather resources each season to compose, rehearse and perform with the chorale members in concert . Join us at our 2018 Holiday Concert! Our aims are to entertain and inspire the community audiences of all ages through choral music - and to provide for the enrichment and recreation of the singers and the community members alike. Awards and Certificates of Recognition continue to be awarded as we reach out into Oceanside & surrounding towns with our heartfelt gift of choral music. Performances often include Broadway show music, popular songs, opera, jazz, seasonal holiday songs and even classical and latin rythms! If you like to sing -- or if you know someone who likes to sing, please pass this message to them, "We welcome experienced and brand-new singers to visit our rehearsals, to meet us, and perhaps join us-- in a wonderful community singing experience in Oceanside!"